Last Wednesday, and each Wednesday during this month of March, I will be working on a project with third graders. 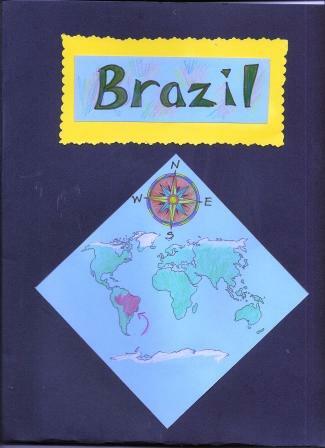 This is an ambitious project that links the student’s research about various countries with lots of bookmaking. 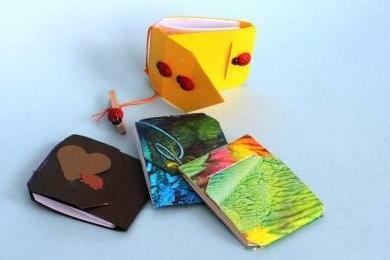 We first make a large folder with pockets, which we refer to as a suitcase, then students make small handmade books in these pockets. These small books will be filled with writing and pictures relevant to the country that each student is studying. There are SMART Boards in each of these classrooms. This means that when I draw out the instructions for making the books the teachers can click on a “Save” button and save what I have drawn. I often try to erase the drawings before the save because I start off drawing big and end up squeezing in the last steps, which makes for a silly looking set of instructions. But erasing the steps before the students can complete them is silly too. This past week a light went on in my head: if I draw out what I want the students to know and save it on-line then I can link the SMART Board to my image….not only that, but I can email the links of the appropriate images to teachers before I meet with them. This can facilitate easy retrieval of my tutorial pages, and it can also be stored as a reference, thereby empowering the teachers to re enforce the bookmaking techniques after my residency is over. 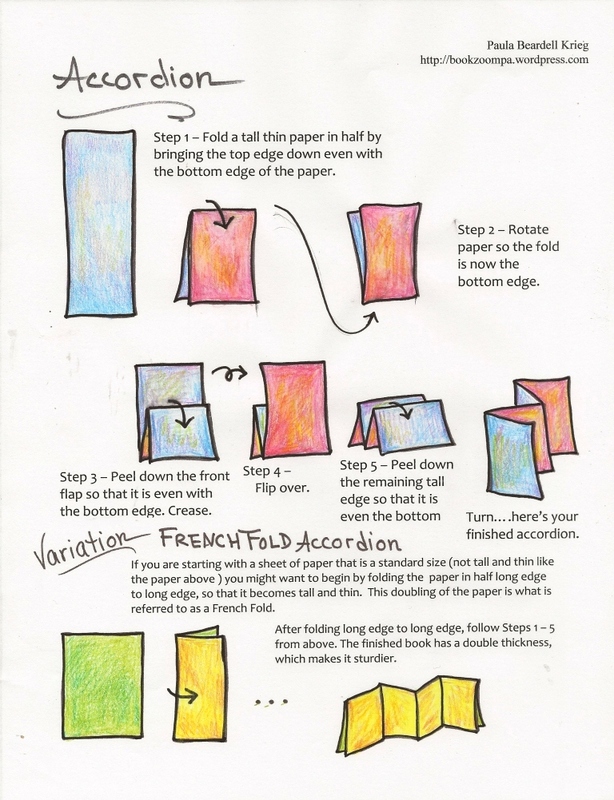 Oh, last week we made a simple accordion, like in the drawings above. I then taught a couple of pop-ups to put in the valley folds. That will be what the next handout will be about. 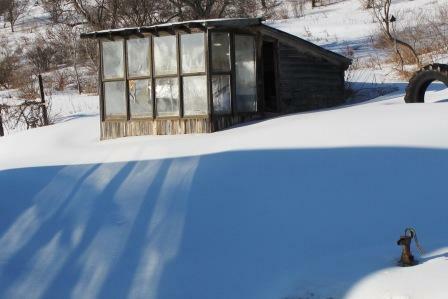 In the meantime, the snow is showing some signs of melting here. Notice that the hand pump is emerging from the snow. We can see our picnic table now. But last week after a thaw, followed by rain, then freezing rain, I had to call and postpone working at a school because my car tires were completely frozen into a 6 inch puddle of ice. 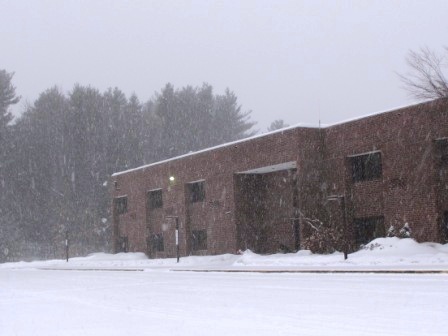 Working as a visiting artist in Upstate New York requires good snow tires. Since where I live is centrally located int he middle of nowhere, I generally drive about an hour no matter where I am heading. If we’re expecting sleet and ice I stay home. With snow, I drive slowly and pray. Yesterday, the temperature was generously below freezing so I was confident that the snow would not turn to ice, and I headed out for a day in with students. It was worth the trip. 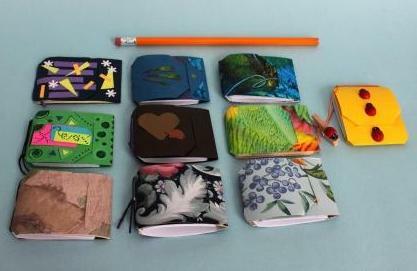 I helped about 60 fifth graders in three different classes make journals. One of the students, James, said that this was an awesome project. He felt that the hardest part of the project was folding the papers . This didn’t surprise me. I’ve noticed that by the fifth grade most students have accepted the fact that papers don’t fold in half evenly. High on my agenda is to take the time to offer explicit instructions on how to successfully outwit the uncooperative nature of paper. To really get students on board with this I bring in bone folders for them to use. 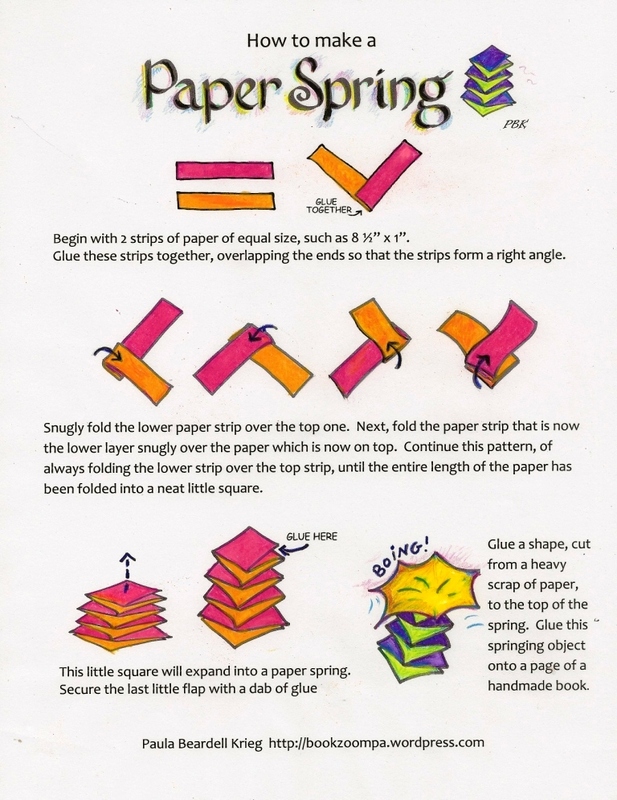 Students seem to genuinely appreciate learning how to fold paper well. We made the covers of the books according to the directions below. The wallpaper covers were made from samples that were cut down to 17″ x 11 1/2″. I’ve also have B&W directions for the Pocketed Book Cover. 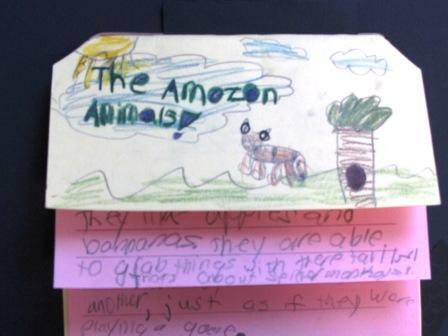 One of the students, Emily, seemed concerned that there might not be enough pages for the content. My impression is that she had big plans for this book. To accommodate the most prolific writers I left behind materials to create a few more books, as well as the suggestion to considering just attaching in a second set of folded pages into the cover, next to (not into) the original set of pages. We attached the pages, five sheets of folded paper, with the modified pamphlet stitch (using 2mm satin rattail cord), hence the notches at the head and tail of the spine. The pages are the size of regular copy paper. The school’s (absolutely amazing and fabulous) reading specialist ran these papers through the copy machine so that lines are printed on the papers. After the pages were attached to the covers I gave students 2 sheets of cover weight paper which were cut to fit into the pockets of the book cover. 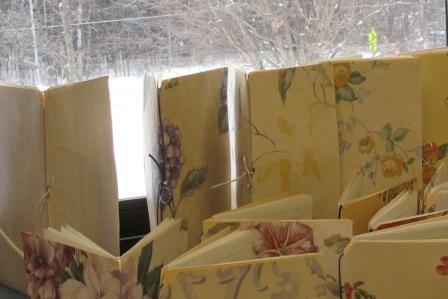 The students slipped these heavy papers into the pockets then glued the upper corners to the book cover: this gives the book a bit more of a sturdy, weighty feel and keeps the wallpaper covers from looking dog-eared. I didn’t take many photos. I wanted to leave before much more snow fell. 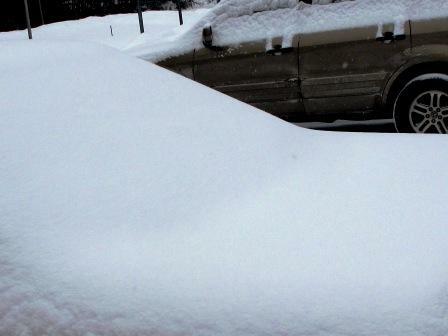 In the picture above, the white mound on the left, that’s my car. I have come across a copy of an article Jelly Bean Books by you, which looks like its been published in a magazine. 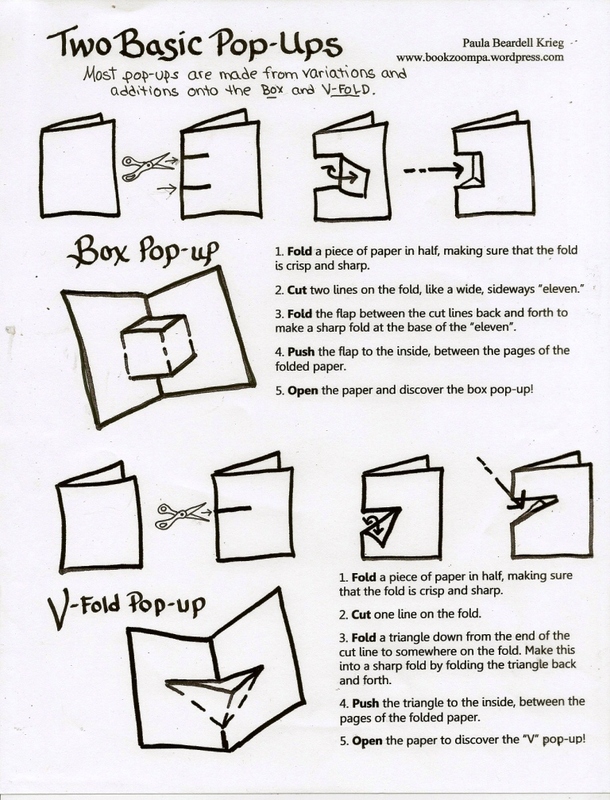 Unfortunately, I only have step 1, and steps 5 and 6, so cant quite work out how you get the book folded and utilise all the lines you make in step one. Would you consider sending me a link to the instructions for these little books please? 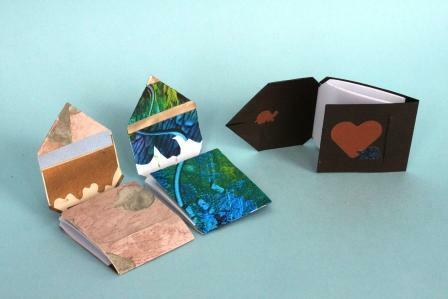 I love papercraft, specifically book binding and card making, and collect any new ideas I find. 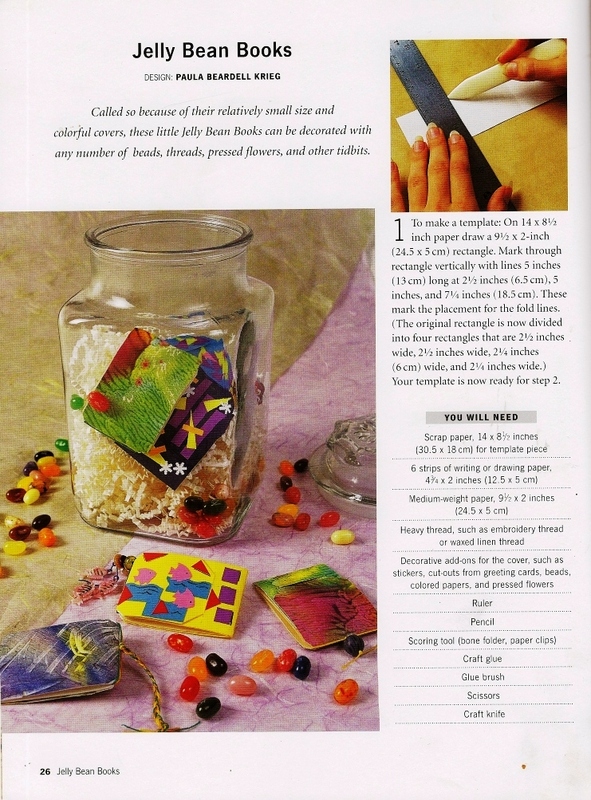 My Jelly Bean Book instructions were written up for a book Making Books and Journals, published by Lark Books 1999. 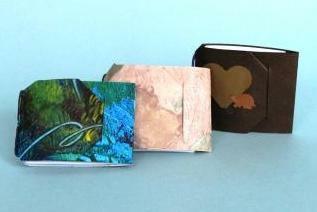 Constance E. Richards collected projects for this book from eleven different book artists. It’s a charming book, full of fine projects, well presented. 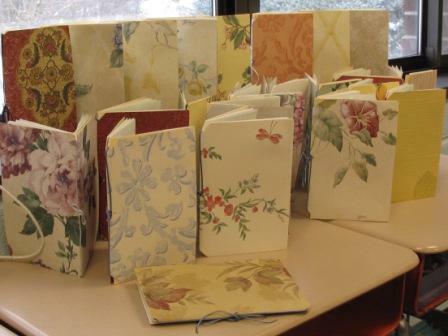 Constance had asked me to come up with some simple book making projects. Since the request came close to Easter, and since the books are meant to be small and colorful, I called them Jelly Bean Books. Something about them being small invites playfulness. I make them using all sorts of papers, with snippets of decorations. Decorating the inside is fun too,. 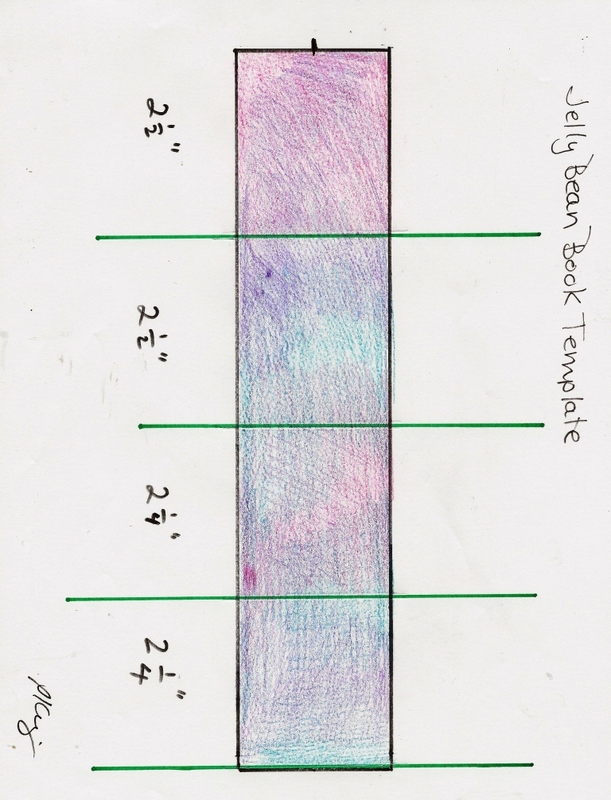 Here’s template for making the cover of the Jelly Bean Books. Start with a strip of paper 2 inches x 9 1/2 inches. Score sections according to the template. 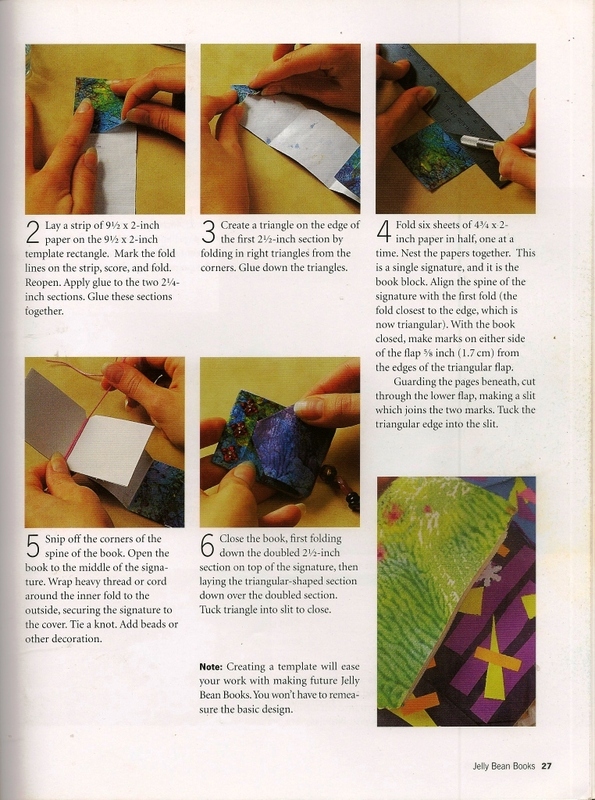 Fold and glue the two shorter sections together. 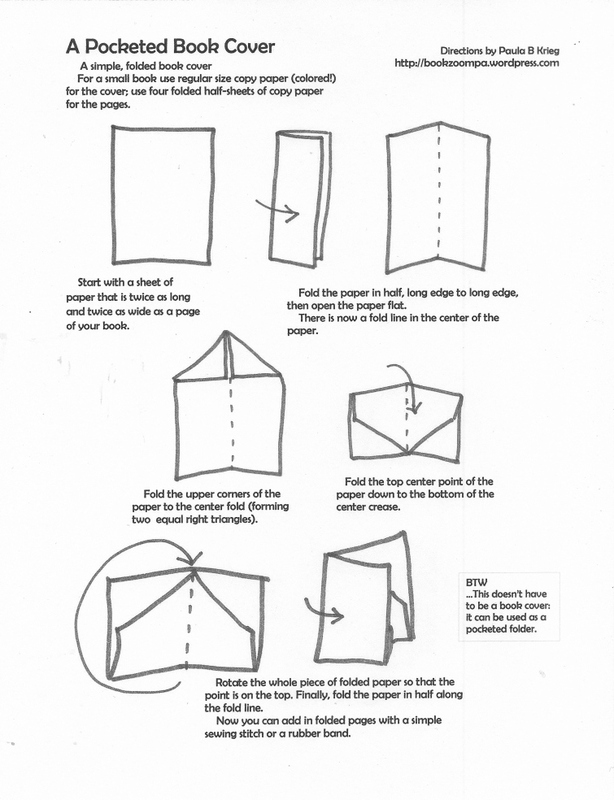 Fold in the corners of the end of the other side of the paper to make a point. For the pages, fold and nest four pieces of paper that are either 4 1/4 or 4 3/4 inches. Attach them to the spine of the book (refer to pictures). Attach in with sewing, wrapping or rubberbanding. Cut a slit into into the folded pieces for the pointed end to slip into. The Making Books and Journals, book was published over ten years ago and can bought, used, for nearly nothing . This being the case, I am going to assume that it’s okay for me to scan the pages for of the book for Bronwyn to print. 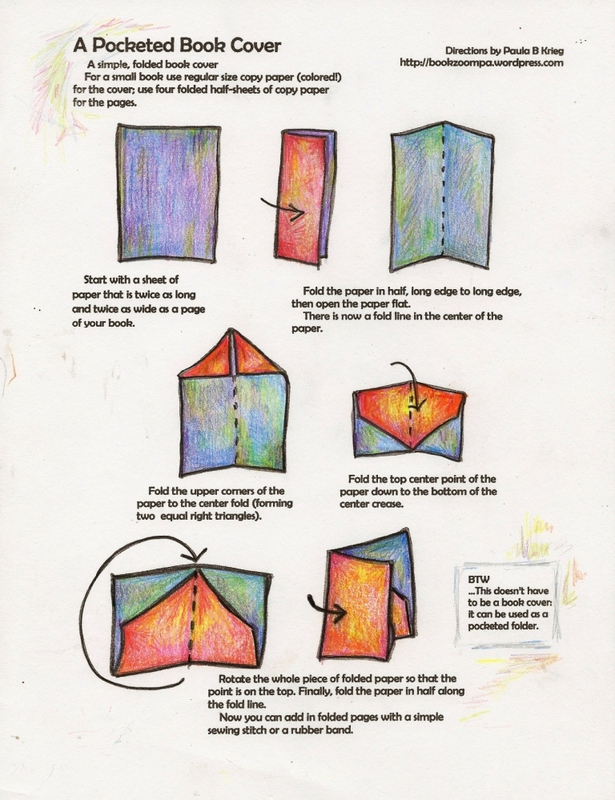 Here are links to the First Page and the Second Page of the directions published by Lark. These directions are more thorough than what I have written here. I want to mention that it looks to me, from her email address, that Bronwyn is from New Zealand,. This fact inspired me to take the time to scan in these pages as I am smitten by the fact that the internet allows people from all across the world to easily connect with each other. And, surpirise, surprise, whilen searching for a used book supplier for Bronwyn, I found this site in New Zealand which announces that this book is going to be republished in March 2011. I couldn’t find a thing about the republishing of this book on Lark’s website, but Amazon‘s site also has the same announcement. If Amazon says it, I guess it must be true…. 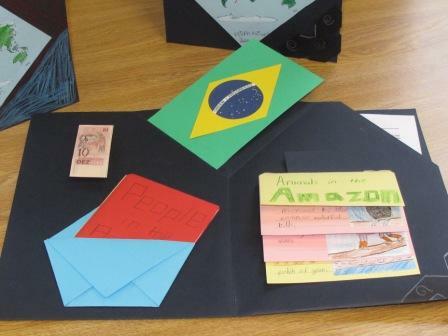 This post is about giving anyone who is interested the specs on how to make the Countries Folder Book that I wrote about in my last post, Making Books about Countries for Third Graders. 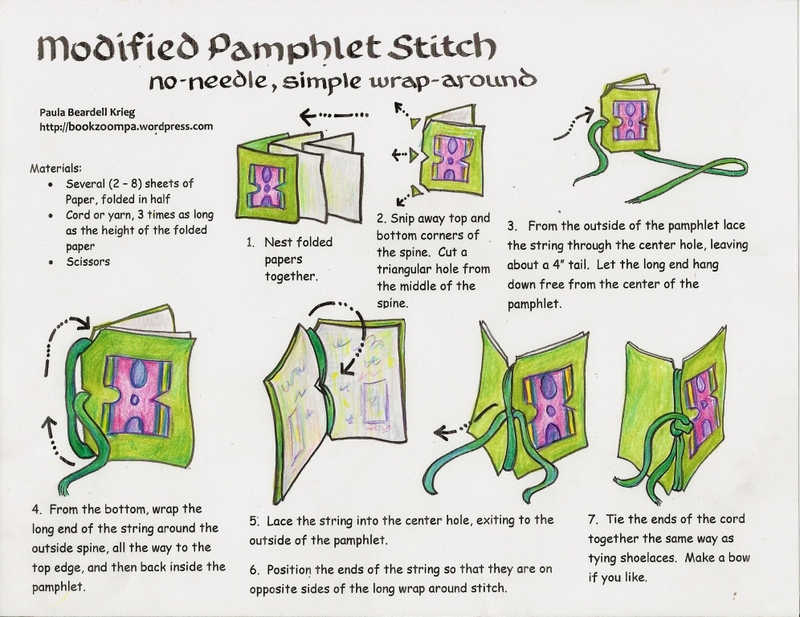 This book has many different pieces to it, which makes it a dynamic project, but requires that the teacher has a good grasp of many techniques. I’m supplying as many tutorial links as I can to help the ambitious tutor through this ambitious adventure. I use a cover weight paper for this book. 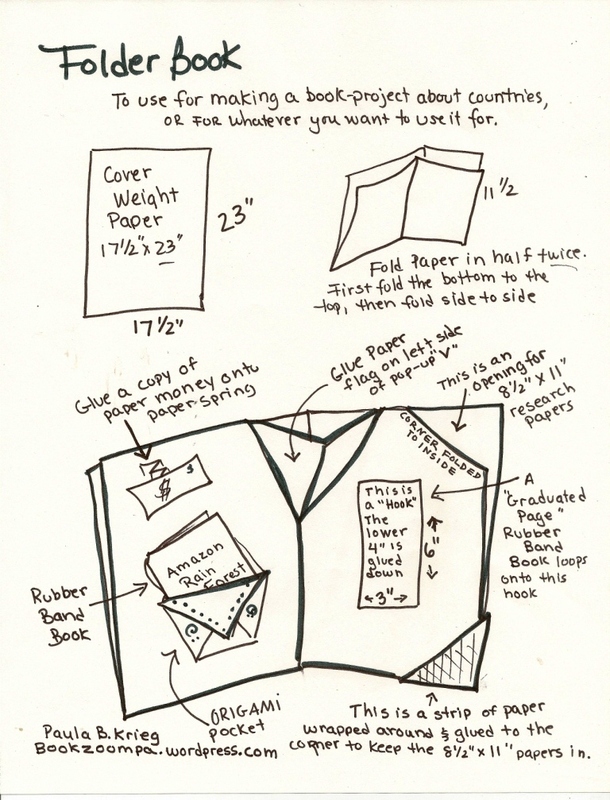 The size is important: 17 1/2″ x 23″, so that when it is folded in fourths, as in the illustration above, the inner pocket is big enough to store full size sheets of paper. 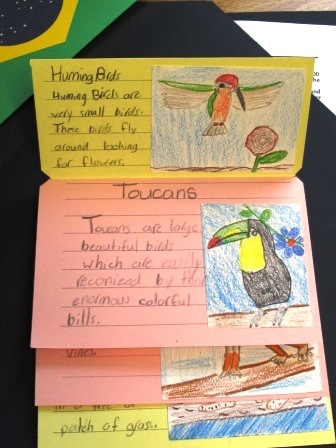 These papers are the students raw notes, which they refer to when they are making their little books. Lower on the page is a little rubber band pamphlet book. This one was made from half sheets of copy paper, folded in half, nested together, then held together on the spine with a #19 rubber band. There are some lovely examples of these in the previous post so be sure to take a look. 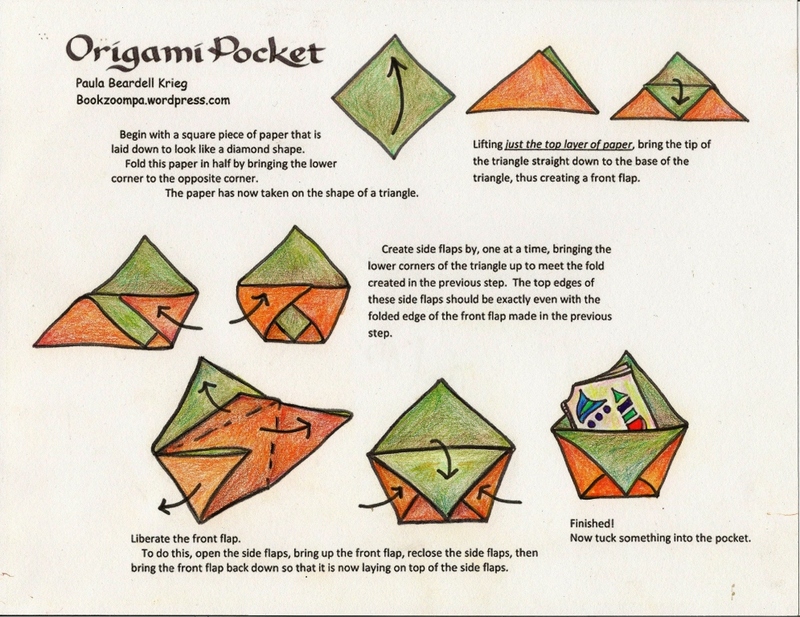 The pamphlet book is stored in an origami pocket. There is a 3″ x 6″ heavyweight paper “hook” in the middle of the right side of this folder. Take a look at the drawing to see the hook: in the photograph it is hidden behind the book. This heavy weight strip of paper is only partially glued down. The upper third is not glued down: a book hangs by its rubber band spine on the hook. 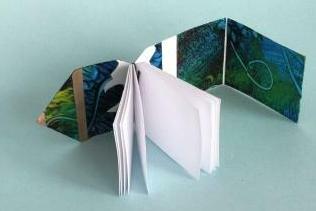 The book on the hook is made of two sheets of paper folded together so that its pages reveal the pages below. They are bound together with a .#19 rubber band. This is often refered to as a graduated page book. 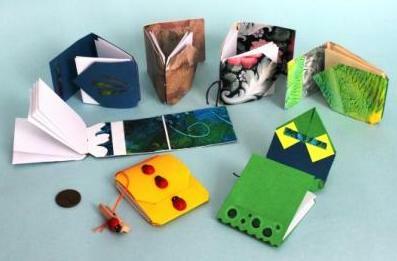 Here are some great examples of some of the graduated page books made by these talented third graders. These pages were made from regular copy paper, cut in half. Notice that we photocopied lines on to the pages. 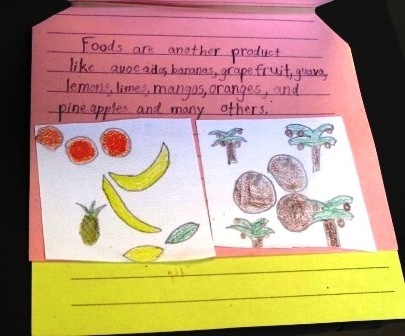 The energy in this child’s writing and drawings makes clear his enthusiasm for this project. The drawings on these were made from the backs of cut up pieces of filing cards. The last thing I want to write about is the flag and the v-shaped pop-up that it is attached to. First, the flag. What I generally like to do with flags is to provide the students with colored paper with which they “build” the flags. For Brazil this meant cutting a green rectangle, a yellow parallelogram and color copy of the center of the flag. Most flags can be “built” fairly easily with colored paper (the USA flag is the great exception!). The Canadian flag can be tricky: I provide the color strips, and an outline of the central leaf, which students color in. Next time I do this project I probably won’t use the v-shaped pop-up, Instead, I think I would try a simpler square. You’ll have to search out your own directions for this one!